gay, even though they have the same genes. Identical twins always have have genes that are identical or almost totally identical. Thus, common sense would seem to require that if homosexuality has a genetic cause, then both twins will always have the same sexual orientation. Both may be straight, both may be gay or lesbian, both may be bisexual. But it appears to many people that it would be impossible for identical twins to have different sexual orientations. In fact, they believe that if one set of identical twins could be found somewhere in the world with different sexual orientations, that would prove that homosexuality is not genetically determined. This is one of the messages that PFOX is trying to promote. IDENTICAL TWINS: ONE GAY, ONE NOT. 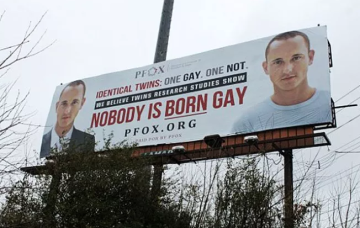 It implies, but does not explicitly state, that the two men shown on the billboard are identical twins, and that one is gay and the other is not gay. It is not clear which one is gay, which one is not gay, or whether the non-gay identical twin has a heterosexual, bisexual, or perhaps even asexual orientation. "orcanyc:" "It’s the South, they are crazy enough said!" "Stache99:" "Identical twins ARE essentially clones. Particularly when it comes to genomic DNA. Regardless, twin studies are some of the most powerful evidence FOR a biological basis for homosexuality." "Ladbrook" recommended criminal behavior -- arson. She/he said: Even if true, which it isn’t, who cares why someone is gay? Why we’re gay is irrelevant. We are fighting for equality, not for a spot in a biology textbook. This billboard is hate speech. It might as well say “no one is born Jewish.” Burn it down. Seriously, BURN IT DOWN." "Dvlaries" "... One wonders whether the money would have been spent this way had marriage equality not come to Virginia last October 6." "I was obviously quite shocked, so that [is] why I decided to send you guys an email saying hey, I'm that guy in that billboard. ... It's actually quite a big thing that there is this kind of discrimination and borderline hate speech going on. ..."
He refers to himself as an "out and proud" gay man, and stated that his photographs were taken almost a decade ago in a stock photo shoot. He signed away the publishing rights to the images at that time. Chris Doyle is a licensed clinical professional counselor and former board member of PFOX. That organization believes that same-gender sexual behavior is a choice, not a genetic predisposition, and that homosexuals can choose to change through prayer, counseling, and a lot of effort. "I am shocked and really disappointed that at the end of 2014, we have a billboard in the middle of our city that says that kind of hate." Identical twins have the same genes or DNA. They are nurtured in equal prenatal conditions. If homosexuality is caused by genetics or prenatal conditions and one twin is gay, the co-twin should also be gay. ... Because identical twins are always genetically identical, [and because identical twins sometimes have different sexual orientations, then] homosexuality cannot be genetically dictated. No one is born gay." This statement would be correct, if the penetrance factor of the allele (variety) of the gene that appears to cause a homosexual orientation were 100%. However, studies show that it is much less -- about 67% as described in the previous essay. Thus it is quite easy to find a set of identical twins who have different sexual orientations even though all identical twins have the same genes. This is because any allele that is less than 100% penetrant may either be activated or may remain dormant in a particular person's life. Their clients' rate of suicide resulting from the therapy.